This year we did something different, when my husband’s birthday rolled around we put the money in savings. The money we would have spent on our anniversary went into savings, also. We did the same thing with my birthday money. 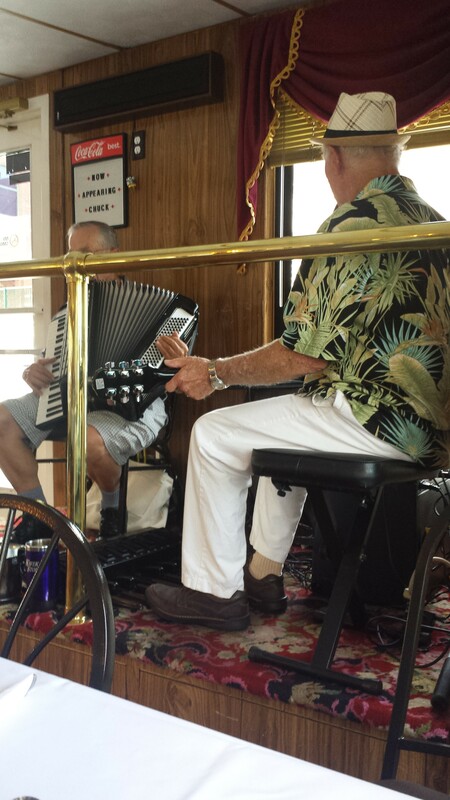 We boarded the “Spirit of Dubuque” at 5:30 p.m. and were seated next to the entertainment. It was a 2 man band with: an accordion, electric guitar, a pedal bass, and a preprogrammed drum kit! The singer played the last three instruments. I was a little bummed until I noticed the cabinet next to the band marked “Life Jackets.” I decided it was the table I wanted after all! The band won us over, by the end of the night we were singing along with them! 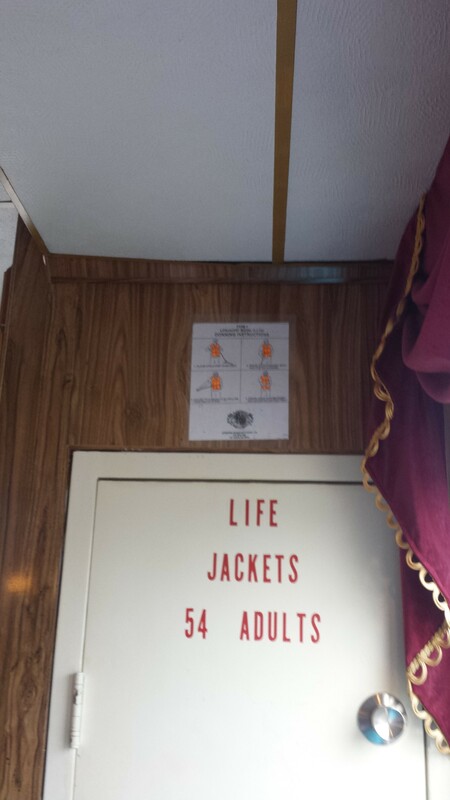 Sitting next to the life jackets! We walked around the top deck while the rest of the passengers were loading. It was in the 80’s and we decided to stick to the air-conditioned dining room after that. 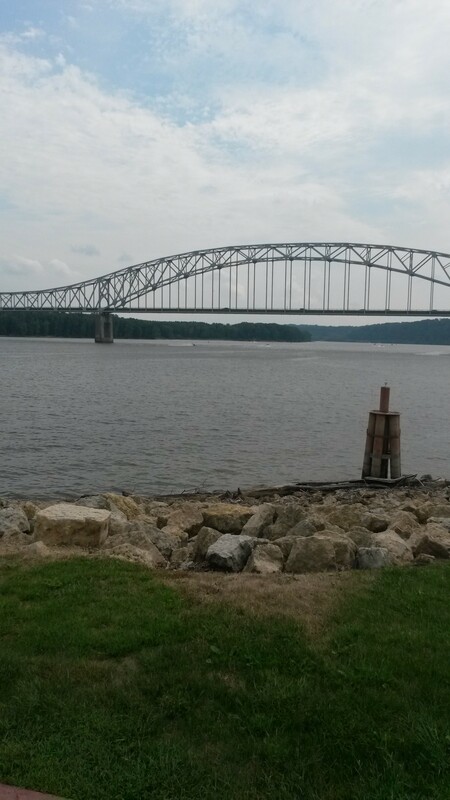 The Dubuque Bridge over the mighty Mississippi. They served: prime rib, chicken Marsala, party potatoes, green bean casserole, cole slaw, rolls, and mini muffins shot with caramel sauce. The hostess had a note that we were celebrating our anniversary. She asked us how many years we had been married. We told her 33. The band recognized each couple and announced the years of marriage and then sang a special song for each one. We didn’t know the one they sang for us, but they played our song earlier, “Could I Have This Dance for the Rest of My Life.” They also sang “Happy Birthday” to each one celebrating on the cruise. 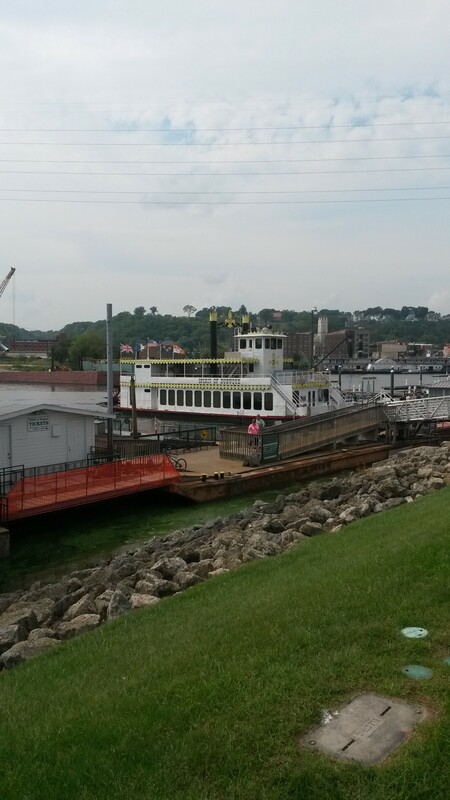 We left Dubuque and rode north until we reached the locks and turned around. We didn’t notice any motion, until a boat sped by a little too closely and we felt their wake. We turned around at the locks. We were the last table to go through the buffet line and I did not have my sea legs! You notice the motion when you try to walk. A teenager laughed at me and I laughed along with her. After all, most of the people at her table were on their third drink and were walking much worse. 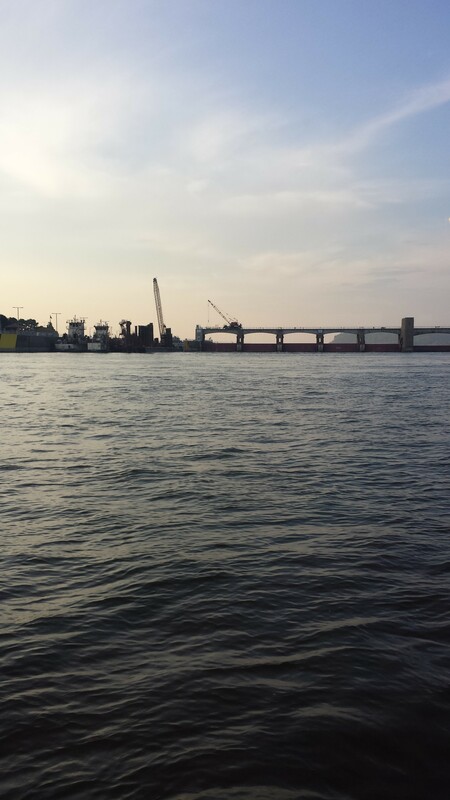 We passed the dock and went just as far south as we had gone north. We watched the sun set over the bluffs of the river and enjoyed the leisurely trip back watching the lights on the shore. 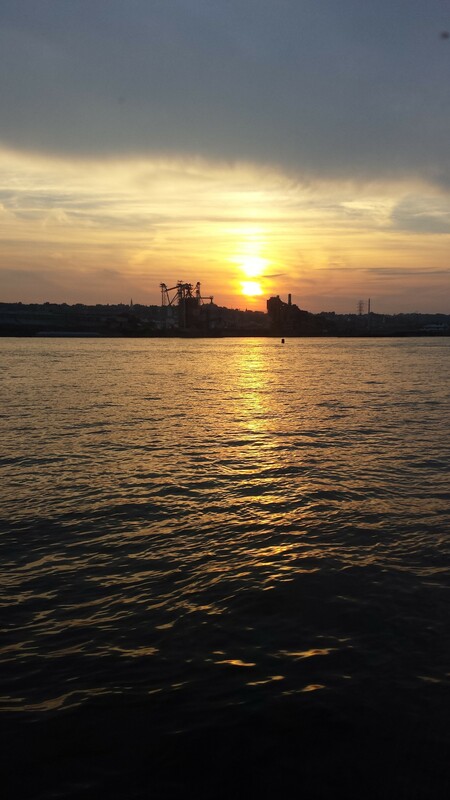 Watching the sunset from the steamboat. We docked and no one was in a hurry to disembark. When the band started to yodel, we decided it was time for us to go! The best gifts are not items you have to dust. The best gifts have a memory attached to them. Every once in a while you should pay for an experience instead of paying for more stuff. Saving money does not mean spending less money. It means setting money aside for something special! I love the new commercial about “Parent’s Vacation Sales!” I’m sure the kids know they are really “Back to School Sales,” but kids and teachers alike are trying to just enjoy summer. Whatever you call it, these sales are a good time to stock up on clothing and supplies whether you are a student or not. I do most of my writing in ring-bound notebooks. There is just something about using pen and paper that I enjoy. (Maybe it is the scent of Pentel blue ink.) 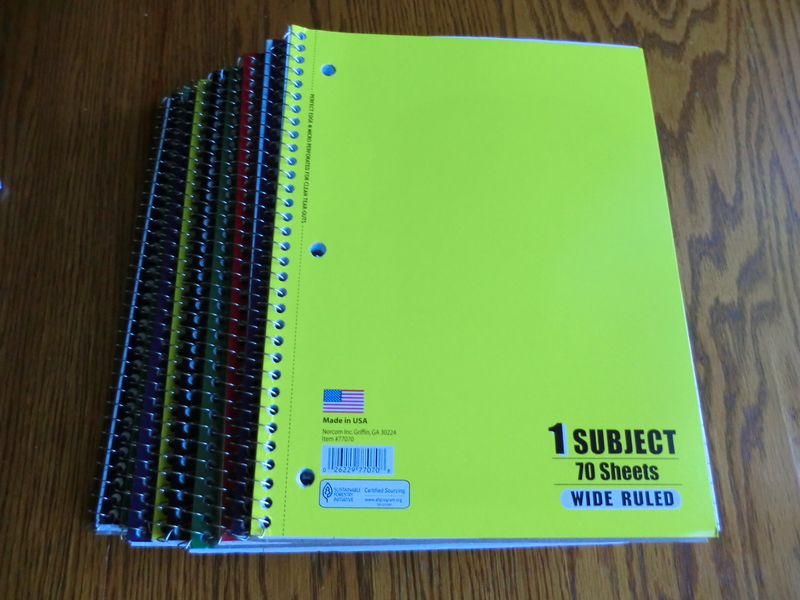 During these sales, I purchase enough notebooks to last me for a year. This is also a good time to stock up on underwear and socks! There are bonus packages with an extra pair in them. You can find inexpensive housewares that are being targeted for college students. Think bedding, towels, small appliances, and electronics. Don’t just shop at the big box stores. Check the flyers for dollar stores and grocery stores. They may have a limited number, but the price is set to move the stock.